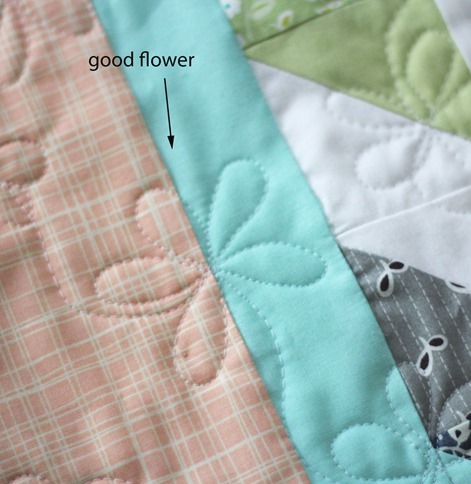 I’ve done a few baby quilts with these flowers and it’s so fun to do…so I snapped a couple of close ups to show. Once I practiced a bit, quilting these flowers was even faster than stippling. Uh-huh…bad. Aaaaaand, as you can see…I left it. It adds “character”. It resembles a flower this time! 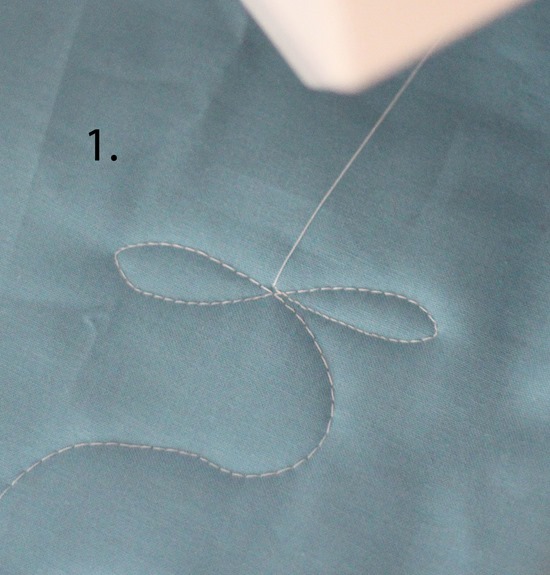 Here are some step by steps…it’s a little tricky to follow the thread but hopefully you’ll get the idea. Basically you are making 2 figure 8 designs, then the last loop or petal, and you move onto the next flower. I drew it with pencil a few times before I tried it on a quilt…it obviously didn’t help as shown by the bad flower picture up there…but with a little practice they now look semi-good. Try it! Nature doesn't have perfect flowers…or should I say natures flowers ARE perfect and yours all look just like natures! What you call "BAD" are actually just character. Those are very pretty flowers. Thanks for the tips. Thank you for showing the steps. Great pictures. I've been wanting to try something new. Fun! thanks for posting this, i will try it. really trying to get out of stippleland. Thanks for sharing this. I have tried flowers a couple of times but have had to pick them out because they looked much worse than your "bad" example :) I did mine a little differently though and this looks much easier. Fun! I don't think I've tried flowers yet, but I have done stars in my quilting. I'll have to remember to try this on my next one. They are great. Thank you for showing. Is it hand or machine sewn? Figure 8s, that will work better than the way I was trying! I need to practice that. I am stuck quilting these darn straight lines! I was going to practice FMQ at least once a week when I got my new machine, that was a year and a half ago! I love making these flowers, especially for baby girl quilts. HI! I like it! I'm going to try it too! Something about the '8' loop makes FM easier;probably because we've made so many '8's' in math. Hi! Me again! I just saw your new fabric line on Windham>WOW! Know it will do well! That's a darling way to quilt; I will give it a try. Thank you for the how-to! Looks great! Thanks for sharing, I'm surely going to try this soon! Thanks for sharing! I have only just started free motion quilting and always looking for new designs. I'm going to try it! What size quilt have you done it on? I get nervous fmqing anything bigger than a toddler quilt. 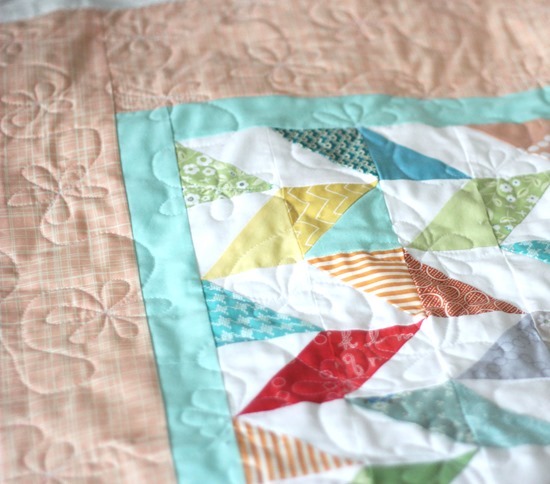 Your quilting is so pretty. I've tried to stipple & all I get is a pointy mess of uneven stitch lengths. Very discouraging & stressful, I must say. Thank you for the explanation and for taking the time to take photos – it helps a ton! Your quilting looks great. Even bad flowers are pretty. Thanks for sharing. Bad or good flowers they are all lovely! I have to try this! Feel hugged! I'd love to try those, too. And I'm so happy you did a brief tutorial. Thank you, thank you, thank you. Trust me, my "bad" flower would make your "bad" flower, look like something I want to aspire to ;-)Thanks for the tutorial. 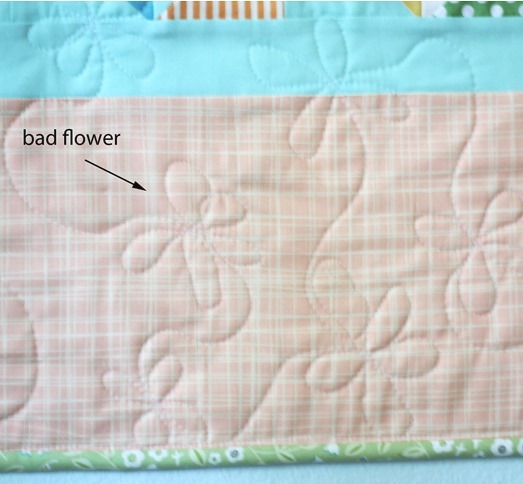 I've been dying to try flower quilting but have shied away from it … now you've given me a bit of courage! Thanks … and love your blog! This is really cute- thanks for sharing! Always nice to have new designs to try! These are very cute. I'm going to try them soon. Thanks for showing, fuzzy photo and all. I actually thought the photos were easy to look at and follow. this is super cute! going to try it today! Thank you for making it look easy and giving me a reason to try these- very cute. I'm impressed by your even stitches! Thanks for sharing your method. 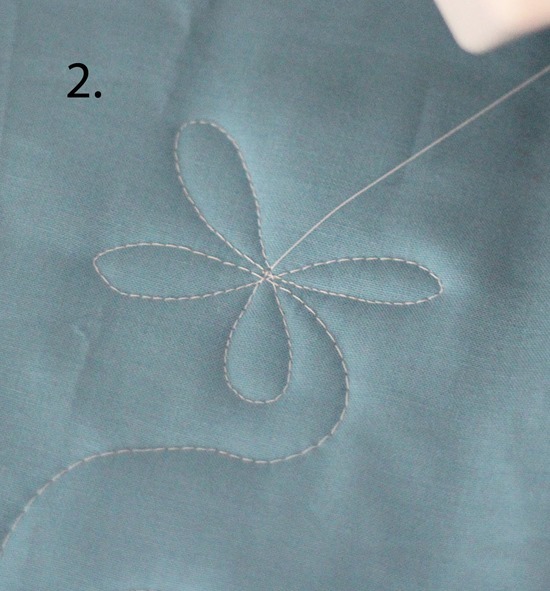 I will definitely have to practice doing this before committing to it on a large quilt. I've always been leery of those curvy lines before. Your little lesson gives me hope that I might be able to duplicate it. :) Thanks again! Super cute! You do such a nice job on your domestic machine. Nice even stitches….darling! Thanks for sharing how you made these adorable flowers. I will have to try them. All it took was a little practice. I'll have to try this one as soon as I get my new-to-me long arm set up in my studio. Very cute, I think I may be able to do them. I had to laugh at your post! I tried these flowers after watching Leah Day and must say my flowers were very similar to your bad flowers!! 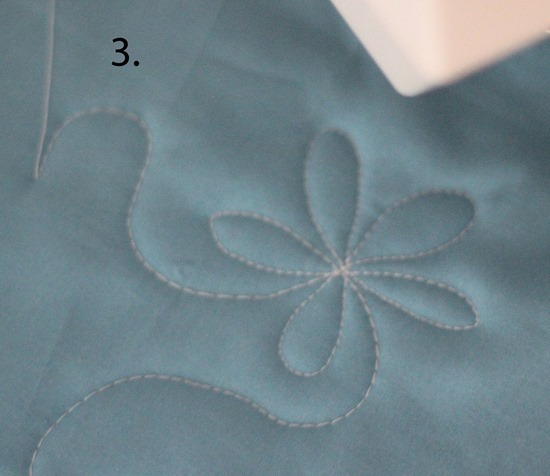 Thanks for reminding me of this quilting design I am going to practice it. Love seeing the first flowers and know that with practice they do get better. No way to improve but to do it on a quilt. Love that design! I am so glad I am not the only one who leaves the 'practice' flowers or whatever on the quilt! Yours look wonderful!!! I love this! I've only done stippling and I think I'll try this next. Getting tired of those squiggles. Just curious but I'm a beginner quilter. I've read your blog front to back and over again. I love it. Do you have tips to pass along to a beginner you wish that you knew ahead of time? I tried out flowers before and they didn't look great, but I like the idea of the figure of eight, it may be an easier way…. I think I'll give it a try when I get home. Thanks for the tip.